It rained. Rained hard and the wind blew. 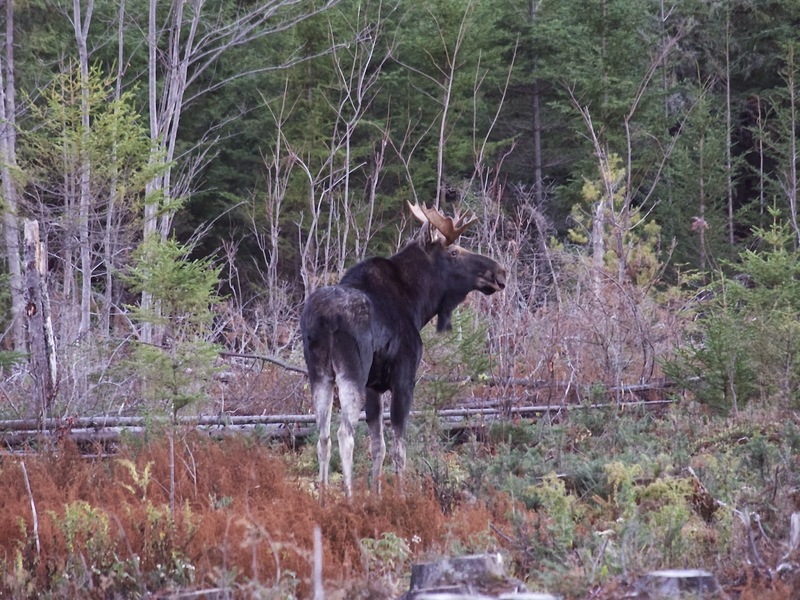 It was anything but ideal for finding moose in the Maine woods. But Brian, Jenn and I knew that the weather was going to be clear and with some rain gear, we were off for an adventures. Last year, I was spoiled; beautiful calm weather and moose first thing in the morning. This year, our normal 4:30am start was pushed back to 10am. About an hour after we left, we were winding down dirt roads heading further into the woods. We pulled into an old skidder road, grabbed our cameras and were off. The sun had finally come out but the wind was still whipping through the trees and causing bursts of leaves to drop from their branches. We walked along the trail, stopping every once in a while to call and attempt to listen between gusts of wind. It was turning out to be a beautiful fall day and we had high hopes for seeing some wildlife. The first chopping that we came to was beautiful - the photo does not do it justice - with Black Spruce below us, hardwoods to our left, swamp to our right. If the day had started off nicer, this would be prime moose territory. Brian called a few times and we listened hard to hear grunts or bellows when the wind would die down but it was apparent that no moose were coming in to see what was going on. We headed back to the main roadway and continued on into some boggier areas. Three years ago when Dad was drawn for a moose permit and we were searching for our moose, he would take me down these paths and down some even thicker and I was sure he was out of his mind. Spaces that deer seemed too big for, would have great moose sign. It still amazes me how animals with huge antlers can get through places like this without getting stuck. Brian began pointing out places on the trees that had been rubbed by moose. 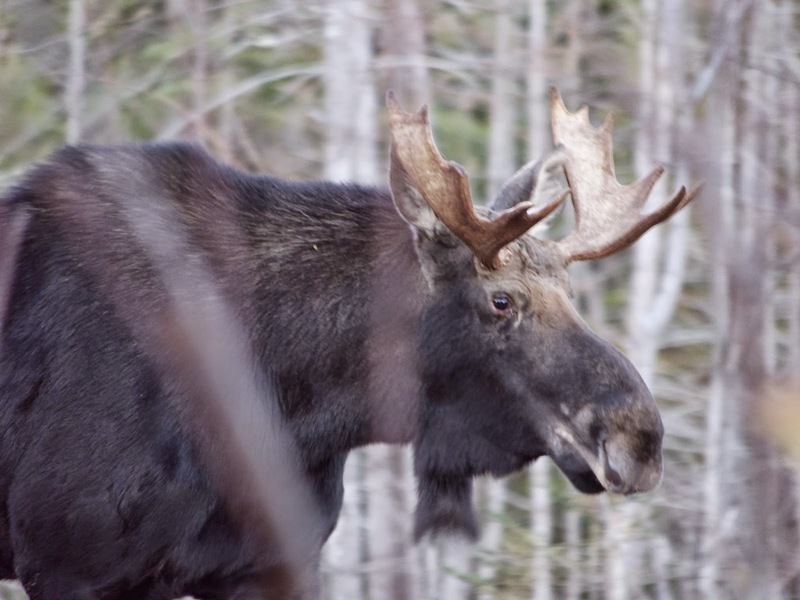 Similar to deer, moose will make rubs to leave scent, get velvet off or to relieve some frustration. The tree had this great rub at the bottom and several smaller nicks all the way to the top that were probably made by the tines further out on the antlers. We walked and walked and walked looking for moose and hoping to hear a call back in response to one of Brian's but nothing came. We headed back to the truck for lunch and to move on to a new spot. As the afternoon wore on, we tried a couple different spots and could not get a moose to call back to us. Brian wanted to try one specific clearing before we called it a night and headed home. The temperature was steadily dropping and the sun was beginning to set. The moon was high and bright and the wind was finally gone. We stopped along the edge of the clearing and sat down on a couple of stumps. Brian started calling. We listened and kept scanning the tree line for movement. When he called a few minutes later, Brian heard the first response. He started pointing behind us and Jenn and I moved to get out of the open. Brian called again and this time, I heard the muffled grunt. I looked off to my left and saw the antlers coming through the trees, along the same path we had taken to come in. It was a young bull and he came within 30 feet of us. 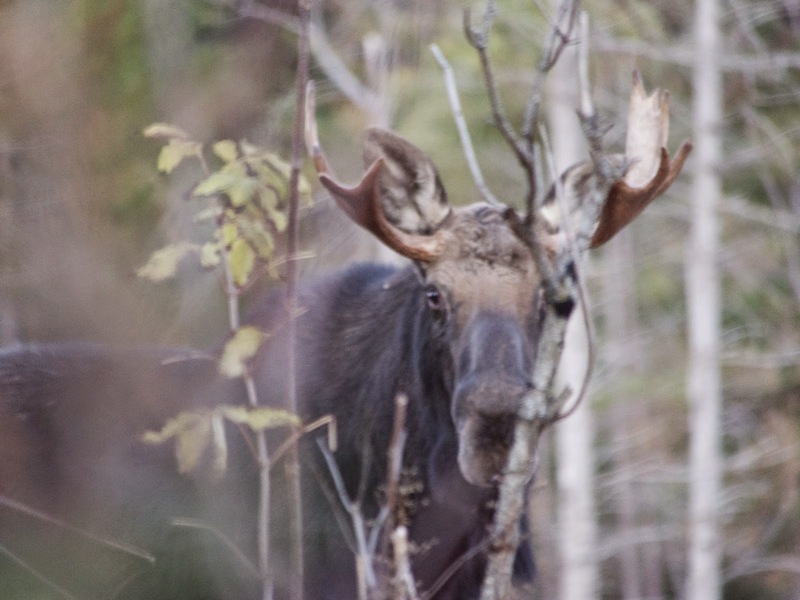 He was not scared but seemed more curious as to what was making the noises of a moose but didnt look like a moose. Jenn and I snapped frantically trying to get the best shots. In the end, Brian was the one who snapped these great photos. We stood there for about 30 minutes with this young bull as he checked us out, moved away from us, came back to check on us and eventually headed off into the woods below the ridge we were on. It was exciting to have one so close and the payoff, after hours of hearing nothing, was great! 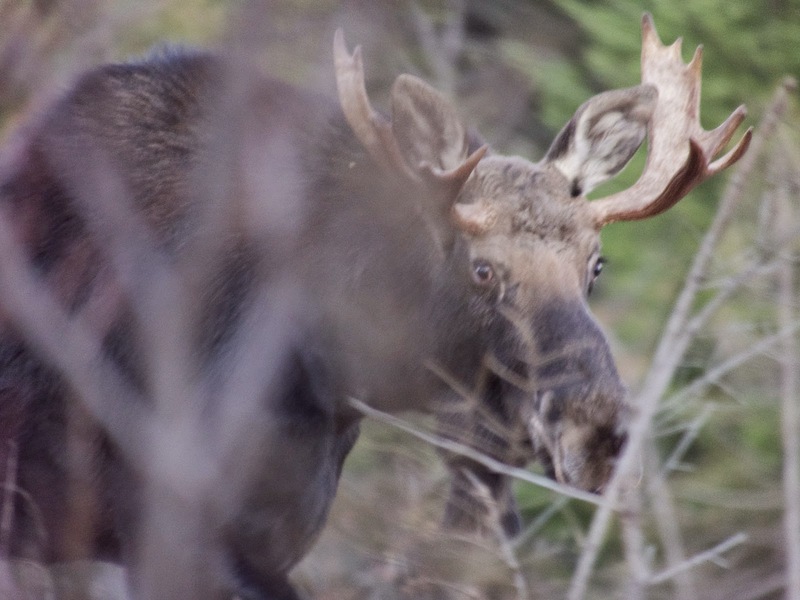 Brian came through with a wonderful adventure in the woods and great photos of this young bull moose. You never know what kind of adventure you will have in the Maine woods! Wow, look at his eyes in the second photograph, looks like he's a bit angry. So love the pictures! thanks so much!